Have you ever wondered what sort of things go through the mind of a naturalist? No doubt it varies from person to person, as all such things do, so I can only tell you for sure the things that often have me entranced as I try to puzzle them out. Here is a "for instance." A couple days ago, while leading a school program, one of our volunteers found this fluffy white mass on the back of a dried leaf that had fallen from one of the trees along our path. Now, I knew it was an egg or pupa case, and I knew I had seen it before, but I could not recall what species it belonged to or any details of its life history. When we got back to the visitor center, and while the students took their lunch break, I grabbed my copy of "Tracks and Signs of Insects" by Eiseman and Charney, and searched for the answer I was sure was in there. No luck. And yet I KNOW I had seen (and identified) it before. My go-to site for all insect ID is the terrific website BugGuide.Net. If you haven't been there yet, you must do so soon. These folks are terrific: you send them a photo of some mystery insect or insect part, and often within a couple hours you have an answer as to what it is. So, off I sent my photo, and sure enough, the answer soon came back: Braconid Wasp, subfamily Microgastrinae. My work had only just begun. This morning I have been scouring my insect books and the Web in search of details about this small ball of fluff. Eggs? Pupae? Life cycle? And while some information is quite readily available, much (to me) still remains a mystery. There are about 2000 described species in the subfamily Microgastrinae. Scientists suspect there are 5-10,000 species possible; that is a lot of unknowns. The Microgastrinae are a subfamily of the Brachonid wasps, which are the second largest family of wasps in the world (right after the Ichneumonids, just in case you were wondering). Over 17,000 species of Brachonids are recognized today, but again, it is believed there are thousands more that we know little to nothing about. Brachonids are parasitic wasps. In general, they lay their eggs on the host (in the case of the Microgastrinae, the hosts are the caterpillars of moths and butterflies), the eggs hatch, consume the host, pupate, and then the adults fly off to continue the cycle. If you have ever seen a tomato hornworm in your garden that is covered with small white ovals all over its back, you are seeing the pupal cases of a Microgastrinae. The larvae ate the caterpillar's "blood" (hemolymph) and internal organs, then tunneled out of its dying body to spin silky cocoons on this back. This is a good thing for you and your tomatoes - not so good for the caterpillar. Anyway, this was all familiar territory for me -- I have seen many a hornworm covered with cocoons, and plenty more photos of other species of caterpillars similarly parasitized. But the fluffy mass that is currently sitting on my desk has no (apparent) caterpillar host associated with it. Why? I continue to search the Web, but even BugGuide has let me down - there are photos a-plenty, but mostly all it says about them is "Brochonid Wasp - Microgastrinae" - no life histories. The best I can come up with at this time is that this is a collection of Microgastrinae pupae (and if I teased apart the mass I would surely find all the little oval pupal cases), and perhaps the desiccated husk of the host caterpillar has fallen away, since by now its purpose is fulfilled and it is obsolete. Knowing me, however, I shall continue to puzzle about this until one day I have found THE answer. In many ways, I can relate to these Victorians, for I, too, love to collect natural objects. My house and my office are full of things I have found out in the field: acorns, rocks, shells, leaves, galls, exoskeletons, bones, sand. I often bring objects in so I can identify them at my leisure, or to incorporate in programs – original objects are terrific teaching tools. But in truth, some things I collect just because they fascinate me. Legally, I am “allowed” to collect some of this stuff because I work at an educational facility that has the proper state and federal permits to possess such things as feathers and nests. What most people do not realize is that these items (all parts of or belonging to our native birds, with the exception of game birds like turkeys) are protected by law…a result of that very collection (and hat) craze of the Victorian era. Many bird populations were nearing critically low levels during this time and we have them around today only because laws were passed that made their collection illegal. So, please be aware that unless you have the proper permits, you cannot legally have most bird nests, feathers, or eggs in your collections. Children are natural collectors; many’s the time we have had school groups here and found students with their pockets jam-packed with acorns, walnuts and more. I’ve had students who really wanted to take frogs home with them, or even worms. Rocks and sticks naturally find themselves in children’s hands. We are by nature drawn to picking up stuff that we find; more than once I have turned around to find a student has plucked the flower I was just showing them. I imagine this is an ancestral habit from when we were a nomadic species, and by investigating our surroundings we could determine if objects could be used for food or as tools to either help us get food more easily or to protect ourselves from those who wanted to eat us! Today nature centers tend to discourage the urge to collect stuff, and in many cases this is quite reasonable, for if every student or visitor took a pocket full of souvenirs home, there would be a lot less here for others to enjoy (not to mention the impact it would have on the plants and animals themselves). However, I often wonder if we have taken this “hands off” dictate too far. If we do not encourage children to pick up and touch things, or to go off the trail to explore, we are putting just one more barrier between them and the natural world. And then we wonder why interest in the outdoors is waning. As with all things, I think there is a happy medium here. There should places where we encourage visitors to step off the trail and go exploring. And it really is okay if a child pockets a walnut husk, or takes home an acorn cap that she has learned to use as a whistle. For it is only by exploring and getting our hands dirty that we engage our minds, learn about the natural world, and develop a love for it that will carry on into adulthood. 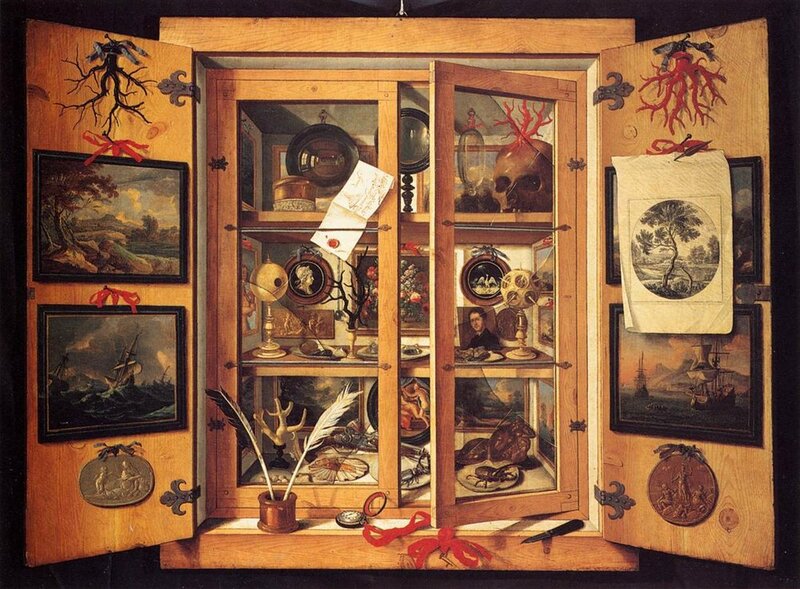 I think every child should have his or her own cabinet of curiosities – a shoebox under the bed that is stuffed with found rocks, bones, and cicada exoskeletons. These will be the memories that tie him or her to the outdoors, memories that when accessed as an adult will hopefully trigger the desire to protect our planet. With caution and respect, good sense and where permitted, collect on.